Phosphorus - 15P Your user agent does not support the HTML5 Audio element. 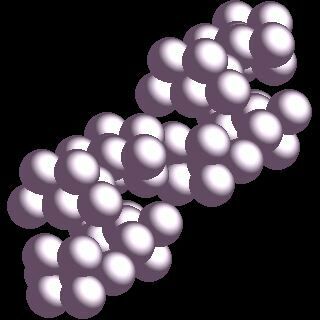 Phosphorus atoms have 15 electrons and the shell structure is 2.8.5. The ground state electronic configuration of neutral phosphorus is [Ne].3s2.3p3 and the term symbol of phosphorus is 4S3/2. Phosphorus: description Your user agent does not support the HTML5 Audio element. Phosphorus is commonly misspelled "phosphorous". It is an essential component of living systems and is found in nervous tissue, bones and cell protoplasm. 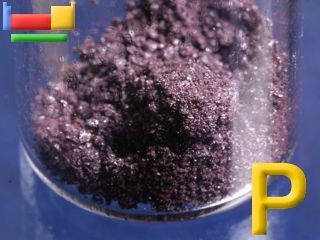 Phosphorus exists in several allotropic forms including white (or yellow), red, and black (or violet). White phosphorus has two modifications. Ordinary phosphorus is a waxy white solid. When pure, it is colourless and transparent. It is insoluble in water, but soluble in carbon disulphide. It catches fire spontaneously in air, burning to P4O10, often misnamed as phosphorus pentoxide. When exposed to sunlight, or when heated in its own vapour to 250°C, it is converted to the red variety. This form does not ignite spontaneously and it is a little less dangerous than white phosphorus. The red modification is fairly stable and sublimes with a vapour pressure of 1 atmosphere at 417°C. This sample is from The Elements Collection, an attractive and safely packaged collection of the 92 naturally occurring elements that is available for sale. The solid state structure of phosphorus is: bcc (body-centred cubic). Phosphorus is a key component of biological molecules such as DNA and RNA. Phosphorus is a component of bones, and teeth, and many other compounds required for life. Chronic poisoning of people working unprotected with white phosphorus leads to necrosis of the jaw ("phossy-jaw"). Reactions of phosphorus as the element with air, water, halogens, acids, and bases where known. Binary compounds with halogens (known as halides), oxygen (known as oxides), hydrogen (known as hydrides), and other compounds of phosphorus where known. Bond strengths; lattice energies of phosphorus halides, hydrides, oxides (where known); and reduction potentials where known. Phosphorus was discovered by Hennig Brand in 1669 at Germany. Origin of name: from the Greek word "phosphoros" meaning "bringer of light" (an ancient name for the planet Venus?). 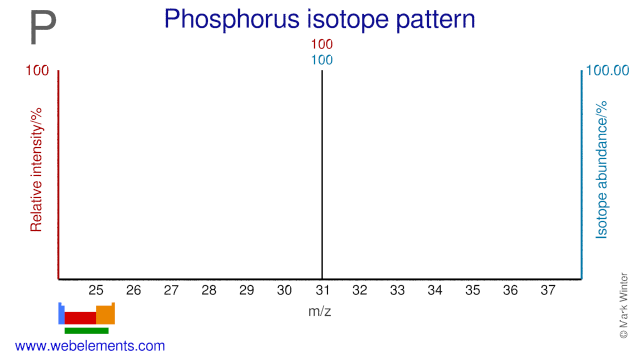 Isotope abundances of phosphorus with the most intense signal set to 100%. Isolation: originally, phosphorus was extracted from urine. However there is plenty of phosphorus in phosphate ores and those ores represent the usual source for commercially produced phosphorus. There is normally no need to make phosphorus in the laboratory as it is readily available commercially. The usial route involves heating a phosphate with sand and carbon in an electric furnace. It is highly energy intensive. The reaction may proceed via "phosphorus pentoxide", P4O10.